Can you believe another month is in the books? Summer is flying by here in the Midwest. We’ve had a crazy weather month but we’re also enjoying exploring new coffee shops and restaurants in our current community. 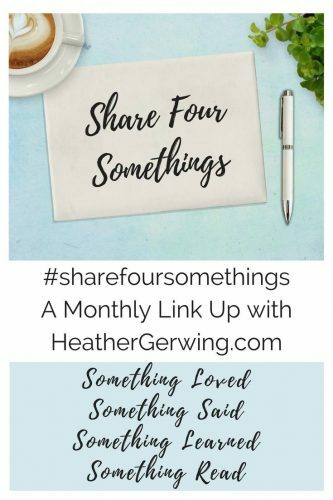 I’m linking up with Heather Gerwing for another month of #sharefoursomethings. We celebrated wedding Anniversary 17 this past week! I loved our time away at the FCA Getaway earlier this month as well as a few hours on a “real” date just the two of us this Saturday. This month the Attorney General took the Bible extremely out of context with a terrible interpretation of Romans 13. Having written a blog post months prior about my studies through BSF in the Book of Romans, I was reminded again how important it is to read the Bible instead of just taking other people’s word about what is in there. The timing was interesting, I scheduled my post to automatically post around the same time all the Romans 13 conversations were happening. I learned this month that sometimes we need a vacation before we realize we need a vacation. Our Preseason getaway was the breath of fresh air I needed in many ways. I loved having girl time with my nieces, exploring the Wisconsin Dells with our kids for the first time and turning off the computer. I discovered the Lose the Cape community this month. I just finished their most recent book focused on parenting teens and I can’t begin to tell you how relieved I am to have found this amazing resource! I love taking time for a quarterly review of life with Emily P. Freeman. March, April, and May were exciting months for our family. I turned forty and our oldest became a teenager! You can read my letter to our son here. I embraced this new decade with joy and anticipation and I’m still not regretting that decision. I was also reminded this quarter of how far a coach’s impact can reach with time and energy invested. We had such an amazing weekend catching up with former teammates, coaches, players and wives. Taking time to publically thank Andy was a small but special part of that time. My Powersheets check-in, as well as my chat with Daniel from First Team Fathers, were great reminders of how far I’ve come in a long and short amount of time as well as how much life we have walked through as a married couple and family of four. 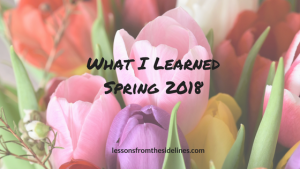 In our current season, we are all thriving in different ways, but we aren’t without our pain points. That’s life though, isn’t it? A constant work in progress. I’ve been wrapped up in writing the last six months and both crafting and reading were set to the side. I’m so thankful to have a reason to read as a part of the Holy Hustle book launch team. Crystal Stine’s timing is perfect. I also listened to Braving the Wilderness by Brene Brown recently and Cory Booker’s United. A benefit of working from home is being able to listen to audiobooks while I work! Reviews of all three books will soon post on my blog. 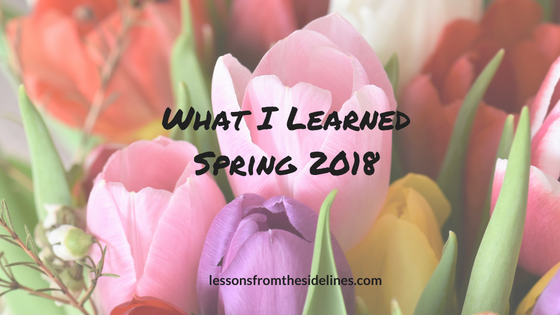 What have you learned this spring? I’m linking up with Emily P. Freeman. We’d love for you to join the conversation!